Oxford International Organizations is first database for analyzing and understanding key documents of international organizations. Each document is accompanied by a concise expert commentary. In order to capture the full bearing of international organizations on various substantive areas of international law as well as on the field of international institutional law in particular, the database includes, but is not limited to, resolutions and decisions of organizations, draft normative texts prepared within the framework of organizations, and constituent instruments of organizations. It also contains court decisions relevant for the institutional law of organizations as well as, occasionally, a treaty to which an organization is a party, where this brings light to issues of institutional law. In this resource the term “international organization” is understood as an intergovernmental organization established between states or other international legal actors by a treaty or other instrument possessing at least some permanence of structure, thus excluding NGOs from its scope. United Nations Publications has recently launched the United Nations iLibrary, the first comprehensive global search, discovery, and dissemination platform for digital content created by the United Nations. It includes publications on international peace and security, human rights, economic and social development, climate change, international law, governance, public health, and statistics. In future releases, the platform will also provide access to other resources such as working papers series and statistical databases. At present, United Nations iLibrary comprises 750 titles in English, and 250 in other official languages of the United Nations: French, Spanish, Russian, Chinese and Arabic. This initial scope covers most of the content published between 2013 and 2015. Some 3,000 more titles published between 2010 and 2015are expected to be available by the end of 2016. The content of the United Nations iLibrary will be regularly updated with approximately 500 new titles published every year on the key topics reflecting the Sustainable Development Goals (SDGs) adopted by the United Nations. Oxford Handbooks for Law Online brings together the world’s leading scholars to write review essays that evaluate the current thinking on a field or topic, and make an original argument about the future direction of the debate. The Oxford Handbooks are one of the most successful and cited series within scholarly publishing, containing in-depth, high-level articles by scholars at the top of their field. With HeinOnline’s Canadian Acts of the Parliament digital collection, you can now access all historical and current Acts of the Parliaments of Canada in online fully-searchable PDF format. The collection includes Acts of the Parliament of Canada (SC) 1792-2012 (annual statutes), as well as all the Revised Statutes of Canada (RSC), from the first revision in 1896 to the last in 1985. Our subscription also includes Acts of the Parliament of the Commonwealth of Australia, 1901-2012. We feel that the law journals’ editors will particularly welcome the acquisition of this collection. This collection includes the complete run of the Israel Law Reports which provides access to more than 220 cases. Cumulative tables are provided for reference to other volumes in the collection, as well as to select cases for specified time periods. Also, a “Table of Cases Published in English Translation” lists in alphabetical order all cases that have been translated into English and appear in the Selected Judgments of the Supreme Court of Israel Series and in the present Israel Law Reports Series. The collection also includes access to the Israel Law Review, Volumes 1-42 (1966-2009). This collection includes the Stair Society Main (Annual) Series consisting of 53 volumes (1936-present), vols. 1-3 of the Stair Society Supplementary Series, as well as books, abridgments and links to scholarly articles from HeinOnline’s Law Journal Library that discuss Scots law. Founded in 1934, the Stair Society serves to encourage the study and advance the knowledge of the history of Scots Law by the publication of original documents and by the reprinting and editing of works of sufficient rarity or importance. It is named after Scotland’s greatest jurist, James Dalrymple, 1st Viscount Stair, whose Institutions of the Law of Scotland, first published in 1681, were the foundation of modern Scots law. As part of its aim to further the study of Scots legal history, the Society produces printed and electronic publications, specifically an annual volume along with occasional other publications, which are now available via HeinOnline to the users of the Gelber Library. This collections includes more than 1,100 titles and 800,000 pages dating back to 1690 on International Law subjects such as War & Peace, the Nuremberg Trials, Law of the Sea, International Arbitration, Hague Conferences and Conventions and inks to scholarly articles from HeinOnline’s Law Journal Library that discuss International Law. You can access the new collections via the main HeinOnline page. Since last Tuesday, the Law Library provides the access to two newly released HeinOnline collections: World Treaties Library and UN Law Collection. World Treaties Library collection brings together works from Oceana’s Consolidated Treaty Series, U.S. Treaty Index, Rohn’s World Treaty Index, Dumont, Wiktor, Martens, the League of Nations, and the United Nations Treaty Series, creating the richest collection of world treaties ever available, covering the time period from 1648 to the present that includes more than 160,000 treaty records. Also included are hundreds of treaty related publications, a bibliography of select titles of importance to world treaty research, and hundreds of the best, and most-cited law review articles related to treaty research. UN Law Collection: vast collection of full text documents that includes United Nations Treaty Series (UNTS), and the League of Nations Treaty Series, publications from the International Court of Justice (ICJ), United Nations Commission of International Trade Law (UNCITRAL), International Tribunal for the Law of the Sea (ITLOS), United Nations Yearbooks, United Nations Serials, law review articles that cite a specific UN Treaty, and more. Since this week, we have access to the new platforms with improved user interfaces for the Westlaw Next Canada and La Reference (former DCL/ REJB). One of the most important new features of the Westlaw Canada Next is the access to an electronic version of the Canadian Guide to Uniform Legal Citation (8th edition). All the links in the Law Subject guide and on the Law Library branch page have been updated to lead to the new platforms. Depuis les années 1980, le Centre Paul-André Crépeau de droit privé et comparé a publié les dictionnaires de la terminologie du droit privé québécois issues du projet de recherche Dictionnaires de droit privé et lexiques bilingues. A présent, le Centre offre sur le site web trois dictionnaires en accès gratuit : le Dictionnaire de droit privé (2ème éd. ), le Dictionnaire de droit privé des obligations ainsi que Le dictionnaire de droit privé de la famille, dans leurs versions française et anglaise. Dans les projets du Centre est de rajouté au site Le Dictionnaire de droit privé – Les Biens quiest paru en format papier en 2012 et la deuxième édition du Dictionnaire de droit privé de la famille qui paraitra bientôt. Ces dictionnaires sont des outils de référence uniques et essentiels pour l’ensemble des juristes québécois, pour les traducteurs juridiques, et pour les juristes travaillant en droit comparé. En exprimant le droit privé dans les langues anglaise et française, les Dictionnaires de droit privé / Private Law Dictionaries sont des outils de connaissance originaux qui tiennent compte du fait que le droit privé québécois évolue dans un cadre linguistique et juridique unique au monde. Ils constituent les seuls ouvrages de terminologie juridique pouvant prétendre refléter la spécificité bilingue et bijuridique de la culture juridique québécoise. 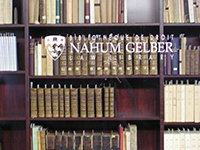 As of this month, the Nahum Gelber Law Library is subscribed to the Investor-State LawGuide Database. ISLG’s technology links you to the specific passages in arbitral decisions and awards where a tribunal discusses a particular legal instrument or prior arbitral decision. The database includes such features as Subject Navigator, Article Citator, Jurisprudence Citator, Terms & Phrases and Full-text search. All materials relevant to publicly available ICSID, NAFTA and ad hoc tribunal decisions are available in ISLG’s comprehensive document directory. These materials can be filtered in a variety of ways to enable you to obtain the research results you need. To access the database, go: Law subject guide / Foreign legislation and cases / Arbitration.